At Wag's we keep it simple. We don't try and fool you with gimmicks or ridiculous claims. The facts are straight forward. You will get the most premium product in every bottle! First we don't even make our first bottle until October of the current season. One deer per bottle GUARENTEED! We only use glass bottles to hold the freshness. We only collect during the 24 hour period when our doe's are in the stage of "standing ready to be bred stage of ovulation" when the pheromone levels are peaked, right before artificial insemination. We have a limited supply every year. If for some reason a store has left over stock we will gladly take it back and discard it. We will never resell a prior seasons product. You get the hottest Ovulation Estrus in each bottle. Never diluted or additives added! 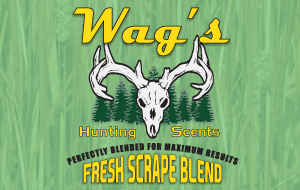 Wag's Hunting Scents, is a family-owned and operated company in Central Wisconsin that specializes in 100% PURE Whitetail Scent. For years we have been providing our customers with superior products and top of the line service. Being serious hunters ourselves, we realize how important it is to have the best products in your arsenal for a reasonable price. Our number one goal is to improve your chances of bagging that trophy whitetail. We start collecting our scents in October of the current season when our doe's come into full ovulation estrus, we then immediately after collection bottle our fresh product and refrigerate. We only use glass bottles due to plastic bottling losing its freshness and pheromone levels faster. We collect on a per store order and ship the very next day, this way we are putting the very best, freshest, most potent product in our customers hand. We take great pride in collecting the highest quality scent on the market; we will not sacrifice quality for any reason. One thing that will never change at Wag's is our commitment in providing the best product and customer service possible. Everything we produce is FRESH (NO PRESERVATIVES) or dilution of any kind. Air and heat break down fresh urine faster than anything else, we recommend refrigerating when the product is not in use. Warning - None of our products are for human consumption. Please keep away from children. Avoid contact with eyes. "Possible Irritant!" 100% PURE Ovulation Estrus from a "single doe" collected for 24 hours during the PEAK of the heat cycle in the "standing ready to breed phase" right before they are artificially inseminated. The estrogen and pheromone levels are the highest at this exact time. This will drive a buck thats looking for a doe crazy! Some people like to refer to this as the HONEY, because it actually smells sweet! 100% PURE Buck Urine with Tarsal Secretions. We only collect from 2nd year bucks. We do this during the same time in the season we collect our Estrus, these guys are trying to dig holes to get into the Estrus collection facility. So the hormones are going crazy. This will down right infuriate another buck as he will think the Intruder is corralling his ladies. This is our only blended product. This is sure to get the attention when applied to an active scrape. This covers the full spectrum of why they need to refresh that scrape and keeps them curious. Customer Testimonials with Their Trophies! Do you take great pictures of your hunting and fishing adventures? Do you have thousands of friends on social media who follow you on every trip you go on? Are you interested in teaming up with Wag's Hunting Scents to share your passion for our products as you continue your pursuits in the outdoors? Well here is your chance. Fill out the application to be considered as a potential Wag's Hunting Scents team member. Selected team members have the potential for free gear, special deals, and opportunities to pass on some great deals to their audience. 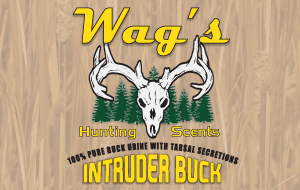 Most of all, thanks for being a fan of Wag's Hunting Scents and you will hear from us if you are selected to be a part of the team.